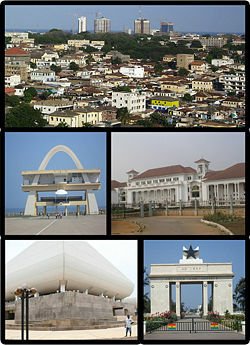 Clockwise from top: skyline of the city, the Supreme Court of Ghana, Independence Square, the National Theatre and the Independence Arch. Accra is the capital, the largest city, and the administrative, communications, and economic center of Ghana. 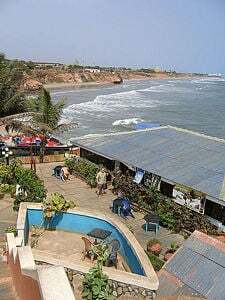 Located on the Gulf of Guinea near the Atlantic Ocean, the city sits partly on a cliff, 25 to 40 feet (eight to 12 meters) high, and spreads north over the Accra plains. Beginning in the late thirteenth century, Ghana was inhabited by a number of ancient kingdoms, including an inland kingdom within the Ashanti Confederacy and various Fante states along the coast. It became its nation's capital in 1877, and contains a number of public buildings reflecting its transition from a nineteenth-century suburb of Victoriasborg to the modern metropolis it is today. Riots in the city in 1948 against high retail prices and European control led to the rise of Kwame Nkrumah as a popular leader and marked an important early step in Ghana's road to independence from the United Kingdom and to nationhood in 1957. 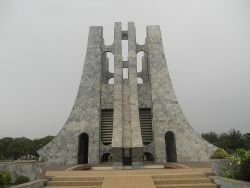 Among the attractions of Accra are the National Museum, with a display of exhibits that reflect the heritage of Ghana from prehistoric to modern times, the National Theatre with its distinct modern architecture, Independence Square, the Kwame Nkrumah Mausoleum, the Accra International Conference Centre, the fishing port at Jamestown, and Makola Market. Today, Accra is one of the wealthiest and most modern cities on the African continent, with a high quality of living by African standards. Though it is a city that has managed to escape the overblown fate of many other world capitals, it does contain its share of slums, congestion, pollution, and desperate poverty. These are issues that city and national leaders must address before they can be said to practice good governance, which is leadership for the flourishing of all peoples. The word Accra is derived from the word Nkran meaning "ants" in Akan, a reference to the numerous anthills seen in the countryside around Accra. The city lies within the coastal-savannah zone. The almost flat and featureless Accra plains descend gradually to the gulf from a height of 150 meters. The topography east of the city is marked by ridges and valleys, while to the west, the low plains contain broader valleys, and round, low hills with a few rocky headlands. The land is mostly flat and covered with grass and scrub, with thick patches of coconut palms along the coastline. The annual rainfall is low, averaging 810 mm, and is distributed over less than 80 days. The main wet season falls between the months of March and June, and a minor rainy season around October. The mean temperatures vary from 75.2ºF (24ºC) in August to 80.6ºF (27ºC) in March. The Odaw River flows through Accra, and the city's main water supply is from the Weija Dam on Densu River, with some water pumped from the Akosombo Dam in the Volta River. 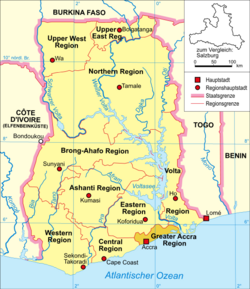 Accra covers an area of about 65 square miles (170 square kilometers). Accra's low elevation, the clayish nature of its soil, inadequate and undersized drains, and the dumping of refuse into drains and water bodies contributes to flooding nearly every year. The earliest recorded site of probable human habitation within modern Ghana was about 10,000 B.C.E. Pottery dating from the Stone Age (4000 B.C.E.) was found near Accra. Beginning in the late thirteenth century, Ghana was inhabited by a number of ancient kingdoms, including an inland kingdom within the Ashanti Confederacy and various Fante states along the coast. Portuguese settlers in 1482, found the present site of Accra occupied by villages of the Ga tribe, ruled from Ayaso, which was located about 15 miles (24km) north. Between 1650 and 1680 the English built Fort James, a fortified trading post, the Dutch built Fort Crevecoeur, and the Danish built Christiansborg Castle. At that time, Ayaso was destroyed in a tribal war, and the Ayaso population moved to the coast, attracted by the prospect of profitable trade with the Europeans, and with other Ga towns. Coastal villages grew around the existing Ga village as well as the three fortified trading posts—Osu around Christiansborg, Accra (later Ussher Town) around the Dutch fort, and James Town around Fort James. These were the centers of what was to become Accra, a prosperous trading center. The west coast of Africa became the principal source of slaves for the New World, overshadowing trading for gold. The Danes left in 1850 and the Dutch in 1872. In 1877, at the end of the second Anglo-Asante War, Accra replaced Cape Coast as the capital of the British Gold Coast colony. After the completion of a railway to the mining and agricultural interior, Accra became the economic center of Ghana. In 1898 a municipal council was formed to improve the town. Earthquakes in 1862 and 1939 destroyed large areas, but the city continued to grow around a seaport (now relocated to Tema), and later a brewery. The Accra Riots of February 28, 1948, in which colonial police killed 29 demonstrators and injured another 237, launched an independence campaign, which led to Ghana's independence from the United Kingdom and subsequent nationhood in 1957. Today, Accra is one of the wealthiest and most modern cities in the African continent, with a high quality of living by African standards. However, as with many large cities there are also slums, congestion, pollution, and desperate poverty. 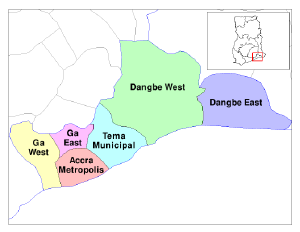 The Accra Metropolitan Area is one of the five districts that make up the Greater Accra Region, which is turn is the smallest (in terms of area) of the constitutional democracy of Ghana's ten administrative regions. Under the local government system, each district, municipal or metropolitan area, is administered by a chief executive, representing central government but deriving authority from an assembly headed by a presiding member elected from assembly members. Osu Castle, formerly known as Christianborg Castle and built in 1659, has been the seat of Government since the early 1920s. Accra is the administrative, economic, and educational center of Ghana, and contains the head offices of all banks, trading firms, insurance companies, the electricity corporation, and the post office. 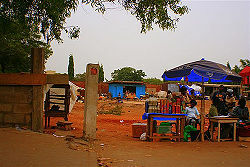 Accra is the location of the large open markets which handle the food supply. The primary economic activities are financial and government services, communications, construction, transport and agriculture (particularly fishing). Over 70 percent of Ghana's manufacturing capacity is located within the capital area. Accra has well-paved roads. Public transit is provided by a mix of privately owned mini-buses (known as Tro-Tros), taxis and buses. Tro-Tros are usually converted mini-buses that run a regular, well-known route. Some taxis also run regular routes, which cost more but provide for a more comfortable ride. The city introduced metro bus services in 2002. Accra is a transport hub, home to the Kotoka International Airport and lies on railway lines to the port city of Tema, 17 miles (27km) to the east, Takoradi and Kumasi, in the interior. Poor residential area of Accra. The Accra Metropolitan Area has an urban population of over 2 million. Accra is the Greater Accra Region's economic and administrative hub, and serves as the anchor of the larger Greater Accra Metropolitan Area (GAMA), which is inhabited by about 4 million people, making it the thirteenth-largest metropolitan area in Africa. The period between 1960 and 1970 saw rapid industrialization and expansion in Accra's manufacturing and commercial sectors. This contributed to high rural-urban migration to the city, and consequently a high population growth rate. The stagnation of the Ghanaian economy during the 1970s slowed the growth of Accra's population. Later, however, the decline in agriculture in rural communities in Ghana and rising industrialization in urban regions, coupled with the late-1980s boom in the service sector, once again propelled immigration to Accra. The primacy of the Accra Metropolitan Area as the Greater Accra region's administrative, educational, industrial and commercial center continues to be the major force for its population growth, with immigration contributing to over 35 percent of Accra's population growth. Decentralization is expected to reduce the migration rates in the future. The major ethnic groups are the Akan (39.8 percent), Ga-Dangme (29.7 percent) and Ewe (18 percent). The Ga, however, form the largest single sub-ethnic grouping, accounting for 18.9 percent. Christians constitute the largest religious group (83.0 percent), followed by Muslims (10.2 percent), people who profess no religion (4.6 percent) and adherents of traditional religion (1.4 percent). English is the official language, spoken by up to 36.1 percent (with other languages), although 14.8 percent speak Asante, 12.7 percent speak Ewe, 9.9 percent Fante, 4.6 percent Brong, 4.3 percent Dagomba, 4.3 percent Dangme, 3.7 percent Dagaba, 3.4 percent Akyem, Ga 3.4 percent, and Akuapem 2.9 percent. On Accra's outskirts are Achimota Secondary School, founded in 1924, and Presby Boys' Secondary School, as well as some of the country's leading secondary schools. The University of Ghana, with its distinctive buildings set among elegant tree-lined gardens, is located eight miles (13km) north at Legon. Ghana International School (GIS), a private non-profit A- Level school founded in 1955 for children from ages 3-18, is located in Cantonments. Abelemkpe is the home of Lincoln Community School, Accra Ghana (LCS). LCS is also a private, non-profit International Baccalaureate school for students aged 3-18, and was established in 1968. The Defence Commission of the Organization of African Unity has its headquarters in Accra. Accra's architecture ranges from large and elegant nineteenth century colonial buildings to concrete, glass and steel skyscrapers and apartment blocks. Shanty towns at the city's edges are where much of Accra's ever expanding population can be found. Accra is home to the National Museum of Ghana, with exhibits that reflect the heritage of Ghana from prehistoric times, the Ghana Academy of Arts and Sciences, the National Archives of Ghana, and Ghana's central library. Also of note is the National Theatre, with its distinctive modern architecture, a lighthouse, the Ohene Djan Stadium, the W.E.B. DuBois Memorial Centre for Pan-African Culture, and several beaches. Near the Parliament of Ghana is the Ghana-India Kofi Annan Centre for Excellence in ICT. Other attractions include the Centre for National Culture, Independence Square, the Accra International Conference Centre, the fishing port at James Town and the Makola Market. Kwame Nkrumah, one of the most influential Pan-Africanists of the twentieth century and the leader of Ghana (and its predecessor state, the Gold Coast) from 1952 to 1966, was originally laid to rest in a tomb in his hometown of Nkroful. His remains were later transferred to Accra and re-interred in the Kwame Nkrumah Mausoleum. The mausoleum, in Accra's downtown, is surrounded by a beautiful memorial park. The American-born civil rights leader, W.E.B. DuBois, was invited to Ghana in 1961 by President Kwame Nkrumah to direct the Encyclopedia Africana, a government production, and a long-held Du Bois dream. He became a naturalized citizen of Ghana in 1963. Du Bois’ health had declined in 1962, and on August 27, 1963, he died in Accra, at the age of 95, one day before Martin Luther King, Jr.'s I Have a Dream speech. His gravesite is in Accra. ↑ Greater Accra Metropolitan Area (GAMA) Cities Alliance. Retrieved April 4, 2018. ↑ Cities & Urban Localities City Population. Retrieved April 4, 2018. This page was last modified on 20 April 2018, at 20:49.